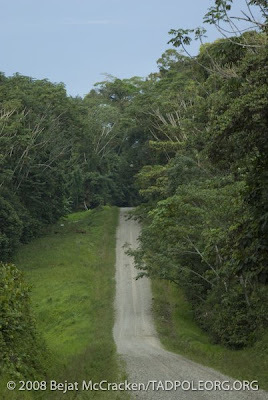 We are leaving this part of the Yasuni Rainforest tomorrow for the oil town of Coca. We will then move to the Via Auca. We will be inaccessible for the next several months, however, I will be updating the blog when it becomes possible once more with entries I compile while in the field. Shawn's work is incredibly difficult and time consuming. 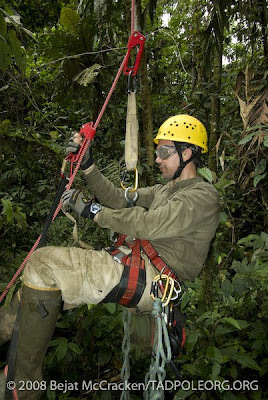 His work is labeled as ground breaking, being the first person to do such research with amphibians within the canopy. His research is vitally important. 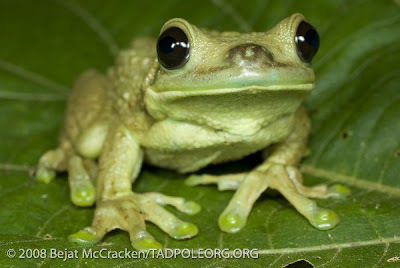 The disturbance of roads has already proven to be a factor in not only frog populations, but also insects and bromeliads. 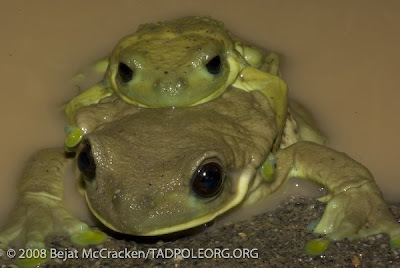 TADPOLE would greatly appreciate your donations to assist in funding all other aspects of our project like the photographic work, documentary, recordings, gps and the finding of new species. Equipment failure is always a factor in this harsh environment and we are in need of replacing several GPS units, antennas and ring flash. 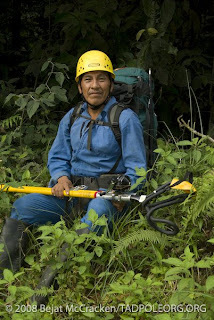 This equipment provides the proof necessary to save the most biological diverse place on Earth, Yasuni National Park, located within the Ecuadorian Amazon. 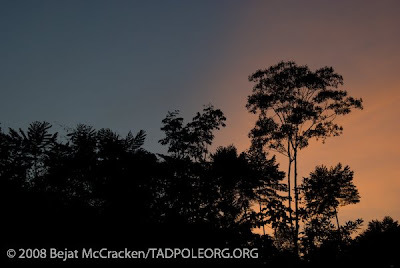 With even a $5 tax deductible donation you can help save this pristine rainforest. 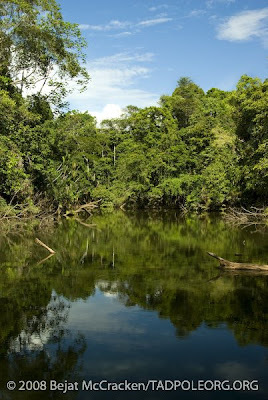 Not only is Yasuni National Park a Biosphere Reserve, but it is also a UNESCO World Heritage Site. 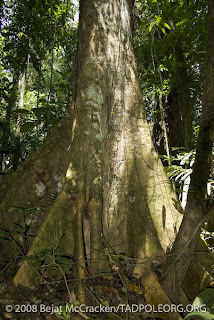 Therefor it is imperative that we must save this magical rainforest for future generations. 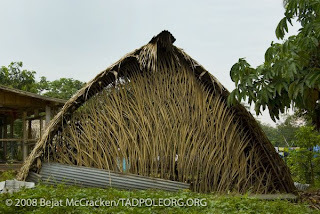 You can make your donations online at www.tadpoleorg.org and select the DONATE NOW. 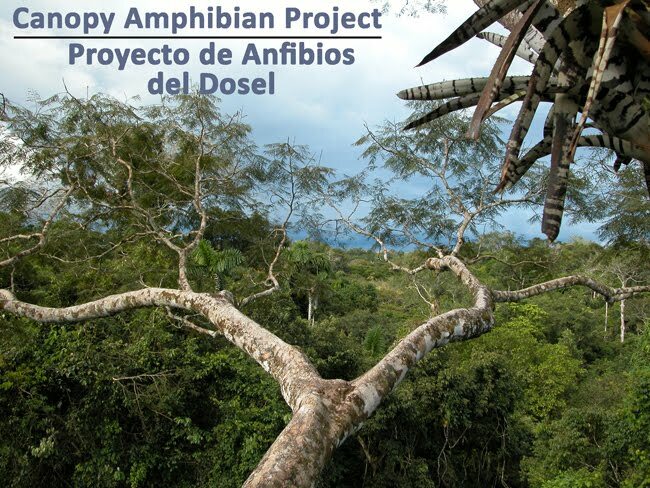 The TADPOLE website also contains a wonderful montage of music and ambient recordings from TBS, titled Amazonal. If you are able to make a larger donation you can receive photographic gifts (once we return to the States). 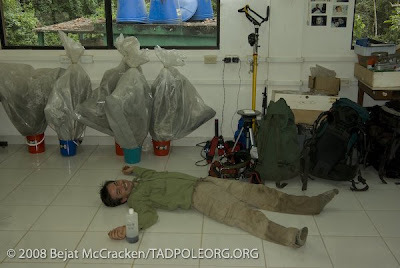 surrounded by his gear & bromeliads. Shawn covered in sweat bees along the road after his final tree climb. 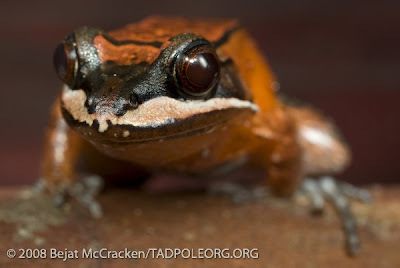 New frog for Shawn to describe Trachycephalus sp. 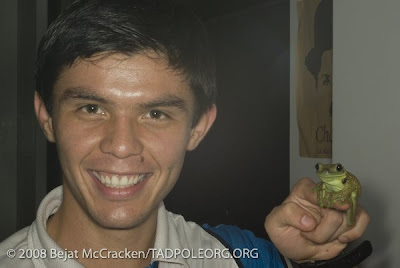 Alfredo with the frog he found on the road one evening, Trachycephalus sp. 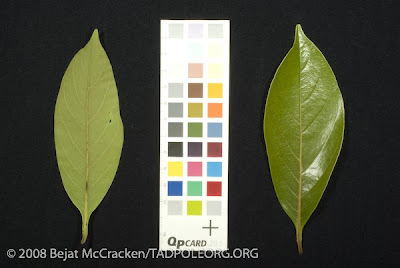 Leaf specimen photographs that are taken for every tree. 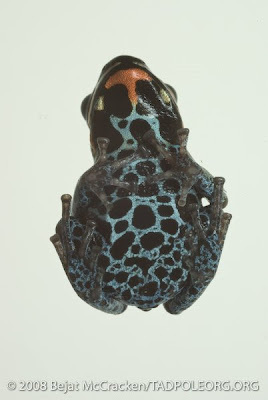 Specimen shot of the ventral view of Dendrobates duellmani. 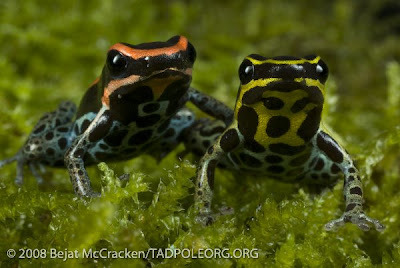 but are now Dendrobates duellmani and Dendrobates ventrimaculatus. 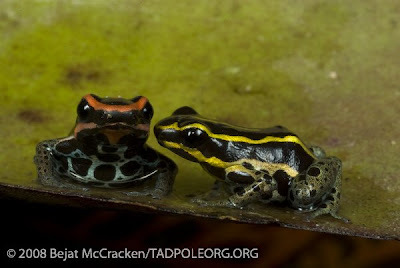 Dendrobates duellmani is found only at the Catolica Station, whereas Dendrobates ventrimaculatus is found at both locations. And they are keeping the secret as to why. 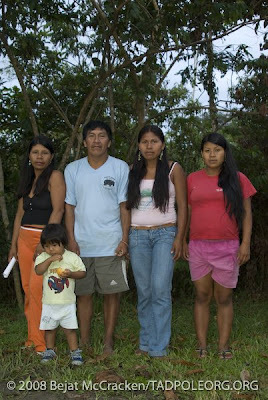 Bolivar with his cousins, Tihue's children and grandchild. 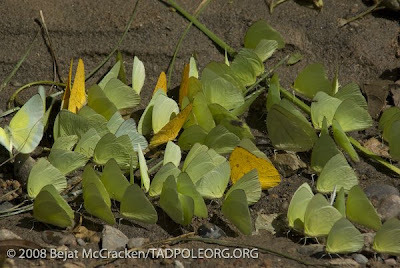 Butterflies congregating along the Via Maxxus. Helicops angulatus found in a puddle at night. so he could catch this semi-toxic snake. 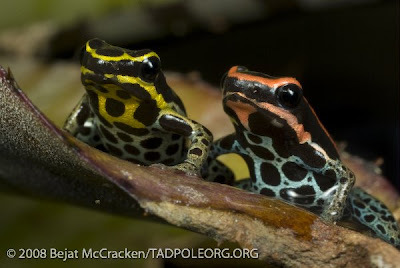 Dendrobates ventrimaculatus and Epipedobates bilinguis. 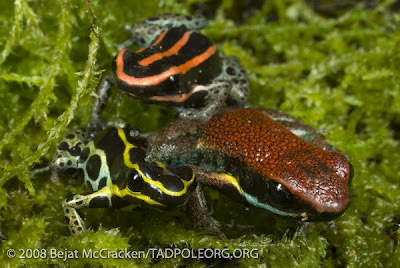 Their coloration is a warning that they are toxic. who has worked within the park for 15 years. seen in the sunset at the Catolica tower. 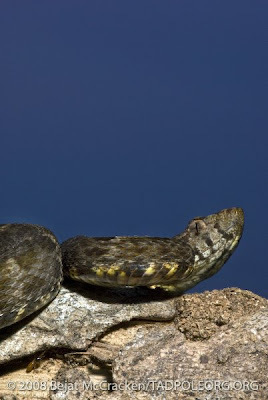 Juvenile fer-de-lance, Bothrops atrox, found in camp. 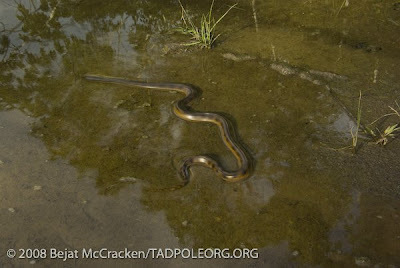 Juvenile Anaconda, Eunectes murinus, rapidly moves through shallow water. Hot afternoon on the Oxbow Lake at the Catolica Station. Shawn's last tree climb along the Via Maxxus. 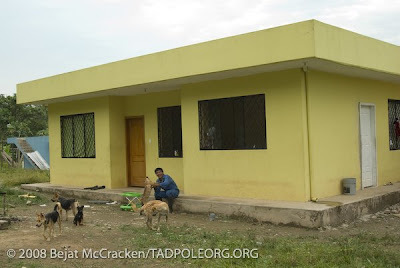 Bolivar and his dogs in front of his house at km 32 on the Via Maxxus. Ferns growing on a hillside along the Via Maxxus. 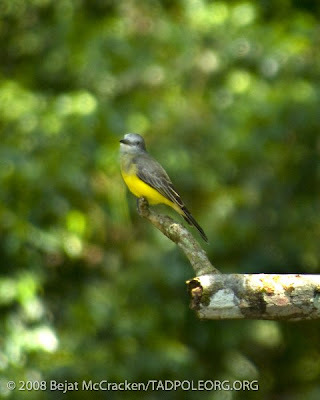 Tyrant Flycatcher outside the lab. 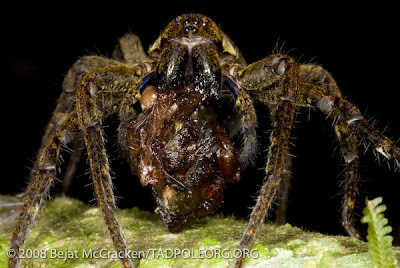 Both predator and prey are spiders. 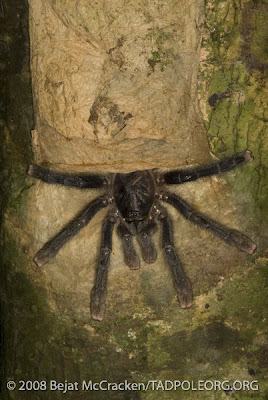 Tarantula in it's camouflaged nest on the side of a tree. Sunset on the Via Maxxus. The days have been cool and alive with activity in the forest. Yesterday I spent the day out collecting many different species of fallen orchids, painting and photographing along the trails. 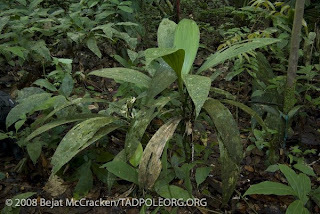 Alfredo and I left in the morning for the plot and he guided me to the orchids that were attached to a large limb. We cut up the limb and brought the orchids back to camp since they will definitely die on the forest floor. 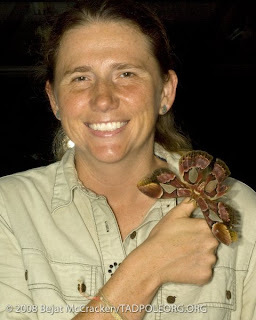 They will be attached to trees in camp so we can keep an eye on them and get photographs of their blooms, which aids in their identification. 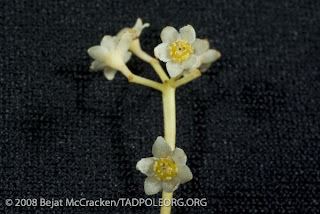 The blooms of undescribed species will be preserved in alcohol and glycerin for description purposes. A terrestrial orchid was blooming in the plot and we crossed to the opposite side of the plot to find this Orchid (as seen in the photos to the left and right). This is where I spent the entire day painting its magnificent bloom. It was a huge orchid. Spectacular! 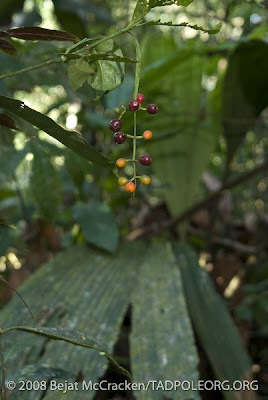 I had never seen anything like it in my life growing from the ground in the lowl and rainforest here within Yasuni. I felt honored to be in its presence. 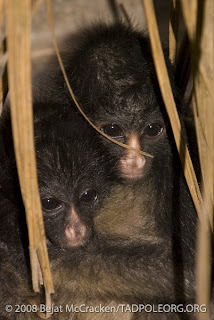 I was visited by a group of Saki monkeys. There were four, which included one juvenile. I had never seen such a large group of Sakis before. 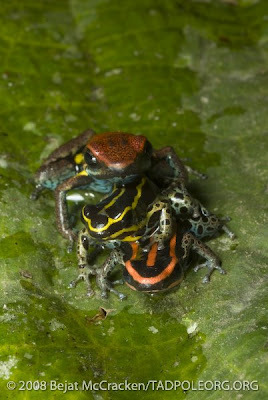 Typically I see two, maybe 3 when there is a juvenile or baby. Their behavior was also interesting. Instead of running they stayed around me for about a n hour, thrilling and screaming obnoxiously. They were all hiding high up in the canopy behind heavy foliage and appeared to be yelling down at me. I stood down on the ground patiently and waited for them to calm down. 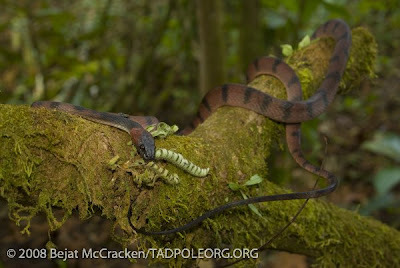 Eventually they did and the large male revealed himself for many photos. He seemed to now be speaking to the others about my presence and they were thrilling/chirping back and forth to one another. I was very excited to get some photos of them since they typically just yell down at me for a few moments and then run high up and away within the canopy. This was 30 minutes of observation and photos (left). My patience paid off. Later that day they returned and I took a break from my painting to observe them again and caught a glimpse of the juvenile. I had to start all over again and spent another 45 minutes with them coercing them out into the open. The lighting was terribly dark and I was unable to get a decent photograph. The large male was intrigued by my presence and seemed to almost follow me back to my painting and observe me. I also saw Squirrel Monkeys, Tocans, Orependulas, Screaming Pehaw and countless other birds. The forest is in full bloom and powerfully fragrant. Food is bountifull and everything seems to be courting and mating. It’s indescribably beautiful. Shawn spent the day completing his survey of the plot. He visited me covered in dirt, sweat and mud. He looked rough, although I did not look much better. I was surrounded by sweat bees that were attracted to my stinky backpack. 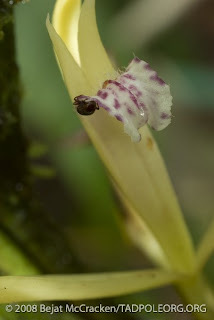 They can be a nuisancece, but as I observed them pollinate the orchid I became very fond of them for a change. As Shawn likes to say, “sweat bees are my friends”. Leaving the plot I got a bit lost. I felt panicked for a moment when I found myself off the trail, outside of the plot, uncertain as to how far I need to go to get back to camp. I was looking at my compass that said I had to go through a deep ravine covered with vine tangles and I could smell that there was standing water so that meant it was going to take so time to get through it all. I was not interested in doing this since I had my heavy backpack full of my painting supplies, camera equipment, rain gear and in one hand I was holding my camera on its tripod. Plus it was getting dark and I needed to get out of the forest before it became completely dark. Then I heard a large vehicle pass by on the road. 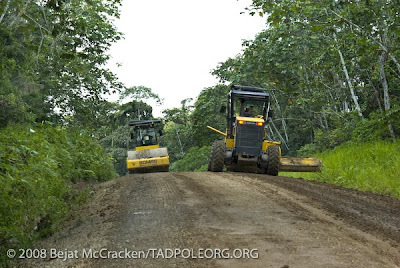 I never imagined I would be happy to hear traffic in the rainforest, but I was and I could hear that I was close to the road, so I decided I had enough time to turn back and find the t rail that would take me out of the forest. 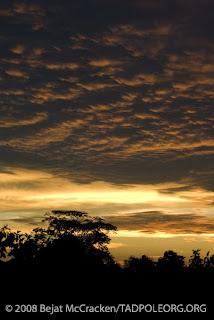 I was fortunate to find the trail and got out of the forest in the fading light of the day, exhausted. I must say I am glad I had my compass. Maybe next time I will keep myself from wandering off the trail looking at monkeys and birds, or maybe not. This is our final week at the Catolica Station. Alfredo and I went out a few days ago to take missing data for the trees Shawn climbed, like GPS points, distance from the road, DBH, densiometer, etc. Some data is not taken at the tree when Shawn climbs due to environmental circumstances, time or limited bodies to carry it all. 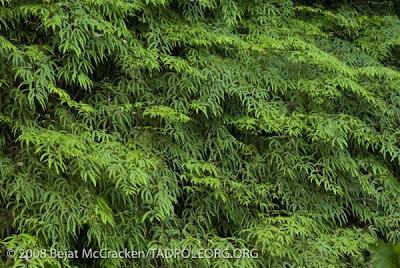 Since we return to take the GPS points, we have another opportunity to collect this missing data, like photographs of the trunk and bark that help identify the species of each particular tree (photo to the right). Later that evening we were visited by a rare moth we had never seen before, as pictured to the above right and left (with Bejat). Gorgeous and enormous, this moth had transparent sections to it's wings that were creamish white color. 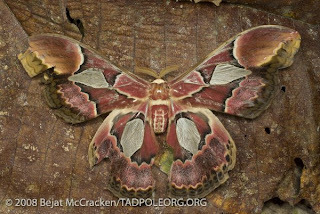 Pablo, one of the Mapadores explained that this moth is consumed by bats due to its meaty substance. I can see how it would be a good meal. The moth visited our lab for several nights until it disappeared. It was apparent that it was in the final days of it's existence. The days seem to be slipping by more rapidly. Kaya left yesterday and now it is Alfredo, Shawn and I. The boy s are working the bromeliads and I am photographing and painting. I am currently painting the Aechmea zebrina bromeliad bloom that we brought back to camp from the final climb with Bolivar. Bolivar gave Shawn a Wao name, Gomimo, which is a Blue Crowned Manakin. 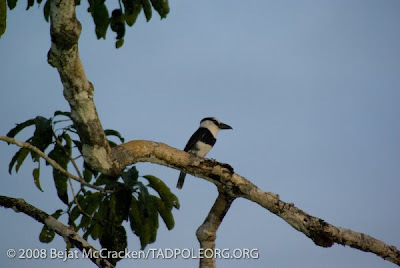 He explained this bird is high up in the canopy during the day and lower in the forest at night to sleep, sometimes even on the forest floor where it clears fallen leaves to make a bed. He calls Shawn ongine teemo inga, directly translated as man strong Tarzan. Gomimo was the name of his mentor, a highly respected leader, teacher and warrior. Shawn fascinates Bolivar and now that he has given Shawn a Wao name he says we owe him a gift. He de clares it is tradition to give a gift when a name is given. We told him we would give him our Spanish-English dictionary that he has been asking for since day one when we leave for the States. He told us he would like a camera like mine. I had to ex plain that was not possible and that we could only afford to give him the dictionary. The entire day he was wanting his photo taken. 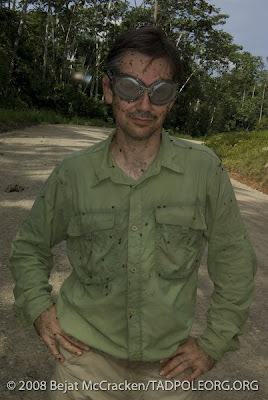 He wanted to try on all the equipment Shawn wears after the climb and have his photo taken. My plan is to develop the photos and give him a copy when we are in the city at some point before we returned to this location sometime in December. He is so excited and has been a ham for the camera. While we were waiting on the road for a ride to take Bolivar home we saw a juvenile Harpy Eagle flying by with a snake in it’s mouth! 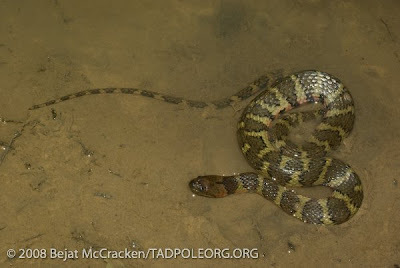 It dropped part of the snake in the road and we ran to pick it up and identify the species. It was a Chironis carinatus. The Harpy landed nearby and finished its snack and flew over to its nest and settled in for the evening. WOW! Now that was a site to behold. It is such a rare sighting to se e the endangered Harpy Eagle and so close with a snake. 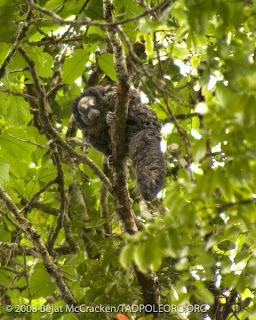 In 2002 we saw a male fly over the Rio Tiputini carrying a Two-toeded Sloth. It landed in a grand tree next to the river to rest as we heard food cries from the mother and juvenile Harpy Eagle in the distance. 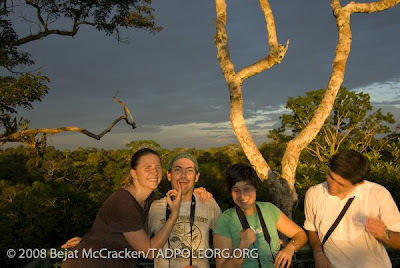 On this same venture on the Rio Tiputini we saw a Puma, Peccaries, King Vulture, Macaws and more. It was Christmas Eve. Bolivar invited us to his home after the climb and showed us around telling us about the Wao culture and how they lived then and now. The smell around the houses was atrocious, enough to make you want to turn and run. Rotting food and other unnecessary odors were overwhelming. It is a different way of life. 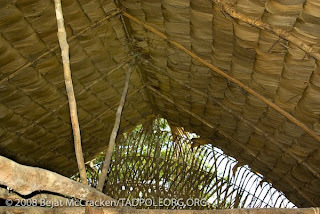 The traditional Wao house is where they hang out now party on the weekend. 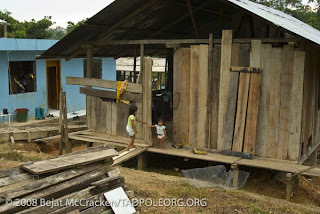 Families traditional ly lived in these crude structures, but now most Wao live in their cement or wood houses. After they sell their bush meat in Pompea Sur, th ey return home with the beer they bought and drink the rest of the weekend. They become quite drunk and shoot off their guns and fight. Researchers are warned to avoid them on the weekends. The dogs are everywhere harassing the pet baby Spider monkeys and peccaries. I must admit it was sad, but beyond it all was the sun was setting over the forest and that was beautiful. I respect them for who they are, but it can be hard to understand aspects of their culture like over-hunting, excessive clearing of the land for crops and the introduction of new species. However, this would not be happening if the Western World would not had drawn them out of the forest. The last tree Shawn climbed with Kaya still here was near camp and we walked 1 km to the tree. It rained for the climb and it only let up once we returned to camp. Once again everything was muddy and we were wet, but it was a light rain and kept the forest cool and somewhat sweat bee free, so in actuality it was a lovely day. Some of the Mapadores joined us for the climb to watch Shawn and were of gr eat assistance. 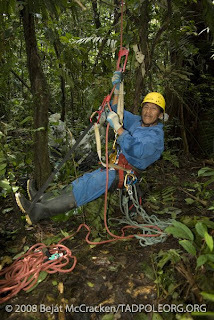 They helped lower bromeliads, take the DBH of the tree and carry back the bromeliads, plant specimen and rope. They are so wonderful. They make the Catolica Station absolutely charming. Our Spanish has become a bit more tolerable to the locals and we can understand more since we have been practicing. It also helps that Alfredo speaks Spanish and he translates and corrects our Spanish for us, I am grateful for his assistance. The Mapadores were perplexed as to the genus of the tree, so I took many photos of the blooms, leaves, branches, trunk and bark. We pressed all the specimens and they are going to compare these with other specimens in the herbarium collection. 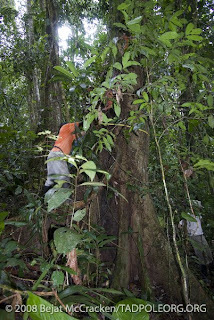 The herbarium collection is spectacular, as one might suspect with the most biodiverse tree species plot in the world. A large laboratory filled with cabinets as tall as the 15’ ceilings containing pressed leaves, flowers and fruit of trees and plants. 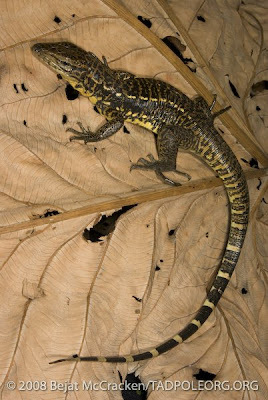 The specimens are contained in folders labeled and organized by family, genus and species. 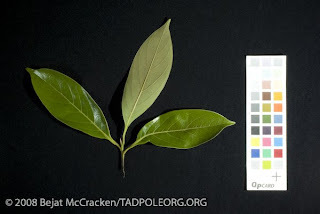 Once a plant is collected it is identified. 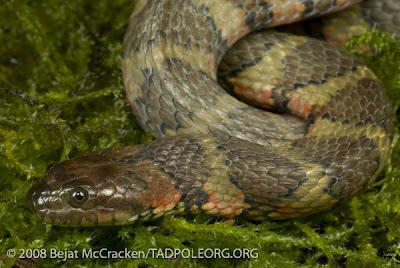 New species are constantly being described, making me ponder what we don’t know. The Mapadores are brilliant. 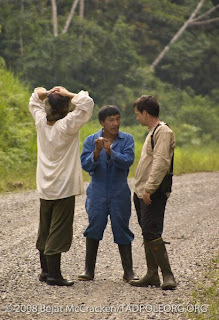 Their knowledge of the forest is amazing and the stories they tell keep me on the edge of my seat. They love to play volleyball in the afternoons and sometimes they play soccer with the Wao. Some of them have worked here for 15-20 years. Change seems to be inevitable and I can only wonder what they must think about it all, yet they are always so optimistic about everything, they are like rays of light from the sun. I have the greatest respect for each and every one of them. Gwawopa in Wao means good-bye. It has taken me nearly 3 weeks to get it right. For some reason I have said every word but the right word when Bolivar leaves, but I do my best to impress him by saying good-bye in Wao. Every word I have said is some non-existent word. We all just laugh and Alfredo finds this to be hilarious since I am known for mispronouncing or confusing similar sounding Spanish words and even making up my own, of course thinking they are real words. But it happens to the best of us. Alfredo has had his moment too, he asked for jam instead of ham on his avocado, tomato and cheese sandwich. However strange we thought this was, we said okay and just thought it was some weird Mexican concoction, until he realized that he had the words mixed up. So, on that note, Gwawopa.